Telus erroneously announced it would be debuting Apple Watch Series 3 support on December 1, but the company explains in an email the final date is still being determined (Update Oct 6/17). No word on pricing yet, but hardware prices should match Apple Canada, while smartwatch cellular data plans should be around the $5 per month Bell is charging. Bell was the first wireless carrier in Canada to launch cellular support for Apple Watch Series 3. Telus was announced as Apple’s second launch partner at last month’s iPhone special event, with both companies saying the debut would be coming “later this year”, but we now have confirmation from Telus next month is the launch. Apple Watch Series 3 cellular models come with 16GB of storage compared to 8GB for Wi-Fi versions, and will allow iPhone users to make and receive calls without having their phone with them. Soon, Apple Music streaming will be supported for LTE users as well in an upcoming watchOS 4.1 update. 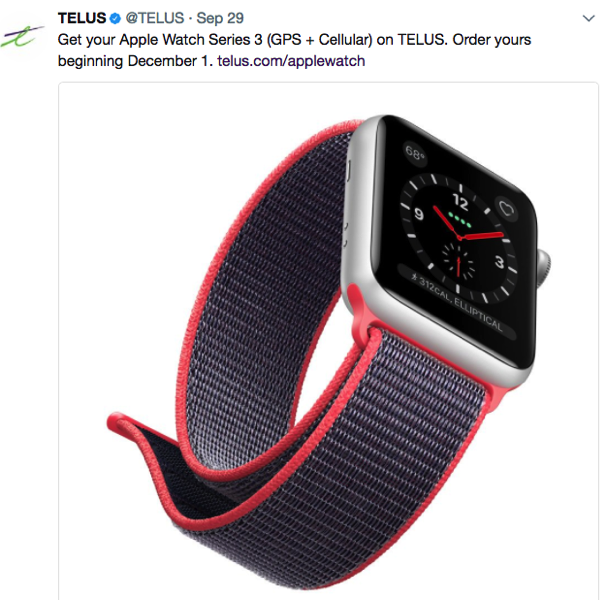 Are you going to sign up for a smartwatch data plan with Telus for your Apple Watch Series 3 cellular model?